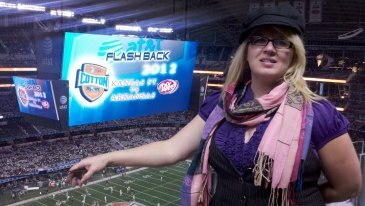 “We’re going to the Cotton Bowl!” When my husband said that to me way back before the End of the World (thanks, Mayans, for excuse to have a party), I wasn’t too sure he was serious. He was. Hmm, football game in January? I shivered just thinking about it. But then hubby informed it the game would be at Cowboys Stadium. In one day I marked three things off my Bucket List: (1) Go to OU football game, (2) Go to a Bowl game, and (3) Go inside Cowboys Stadium. Our team lost, but that’s okay. I saw a fight in the stands. Some riveting entertainment that altercation was! I still have yet to write my letter of complaint to Jerry Jones informing him I will not be back until he puts in a Starbucks on every level. I’m a writer. I procrastinate. 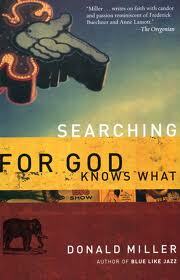 To kill pre-game time, I figured I’d catch up on some reading—Searching for God Knows What by Donald Miller. During the game, my book rested with my purse under my seat. Consequently my book will now forever smell like beer. Donald Miller is fine with that. When I was in high school, I went with my fellow student council officers to a leadership conference. One team-building exercise included a thought-provoking game of Lifeboat. You know, a boat-not-the-Titanic is adrift at sea, and in the lifeboat are a male lawyer, a female doctor, a crippled child, a stay-at-home mom, and a garbageman, and one person has to be thrown overboard to save the others. Which do you choose? Other variations of the game exist (our game had more racially, intellectually, and economically diverse tributes to select from), but all variations are created to achieve the same result: Deciding who has value and who does not. Last fall I volunteered at a writer’s conference. For reasons too long to explain, I had one lowly ribbon on my badge. The gal helping me on the second day came in and took charge. Doubtful her nose could get any higher when she looked down on me. Then a fellow author stopped to ask me what the pins were for on my badge. The moment I said, “This pin is because I was a Golden Heart finalist, and this one is for when I got booted out because I sold my first manuscript,” my helper suddenly looked at me differently. Like I had value. I don’t want to be a person who thinks something like that, let alone says it. But I did think it. I did. *sigh* I did. Love is far easier to say we have than it is to practice. Forget the world for a moment. Miss Writer, you there, me here . . . do you love your fellow writers? Yes. Really? Are you patient with other writers? Kind? Do you care more for other writers than yourself? Do you want what they have? Love is not boastful or proud or rude. (ouch) It does not demand “me first!” Do you allow other writers to irritate you? Do you keep a record of being wronged? Love does not rejoice when other writers grovel but rejoices whenever the truth wins out. 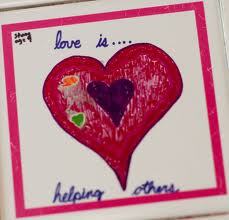 Love puts up with things, always looks for the best, never loses faith, and endures through every circumstance. Great post, Gina. As a pre-published author, I am keeping a mental list of dos and don'ts on how to act when/if I get pubbed--like, if you offer a book giveaway, make sure you follow up and mail out that book THAT WEEK. Keep interacting with people on your blog, don't let comments go unnoticed or some people will stop visiting. We all have different paths to publication and we all write/read different stuff. Don't bash other's writing just b/c it doesn't fit into your style/mold/genre. And yet, don't say only good things about people you crit--give them solid advice. There is such a need for mentoring in this biz. I'm actually going in w/some author friends and starting a website on April first called Married...with Fiction. We hope to pull from ALL arenas of the publishing world--pre-pubbeds, pubbed authors, editors, agents...and mentor/support each other. Guest posts like yours today will be so helpful to other authors. When I was at ACFW, I had no ribbons. :::sniffle, whine::: Mostly I just wanted a Books and Such one. Nice post, Gina. I agree; love is far easier to say than to practice. I will have to read Donald Miller some day soon. Not for the beer smell, of course. Dina, yes, he is probably happier with the beer stain and smell. DeAnna, I told Tamela that Laube Agency needed to make ribbons. In fact, I may just have to send Steve a prompt. I generally know who Tamela's clients are. Not so much with Laube as a whole. LOL, Suzie! Yes, do read any of Donald's writing. I like to re-read Blue Like Jazz every three or four years. How sad that we still judge each other based on our outward "value" when in truth, our value is in Christ. Not in ribbons, badges, accomplishments, successes, or anything created by humans. Reminds me of the Max Lucado book about Punchinello and the wooden people who wear stickers. It's a kids' book but it hits me every time. Good reminder, Gina. Loving others isn't easy. Not when we realize what it really requires. Not when we acknowledge how bad at it we can truly be. As long as we keep moving in the right direction, I guess! *sigh* It doesn't matter what sphere of humanity we get involved in, there's always that person with his or her nose in the air. Learning to love THEM is one of my biggest challenges. You always find the most intriguing nonfiction books, Gina. Now I need to add another one to my TBR list. great post. great food for thought too. makes me want to take a good, long look at myself to see how much i reflect Christ's love. not just pay lip service. appreciate the reminder to value people the way the Lord values them. Great post, Gina. I really like how you lead into it. I'd love to get a look at your Bucket List someday. Congrats on your accomplishment of becoming FHL chapter president. Yee Haw!!! lot of your posts to be thoroughly researched. Do you offer the option for guest contributers to contribute to your blog? I would love the chance to post on subjects related to the content that you write on on your site. I was here at dawn and really blessed by this post today, Gina. I have to say that I've had those reactions--well, if you aren't going to like me, then I'm not going to like you. What if we all wore ribbons and pins that told the truth about us. Published or unpublished would be the least of our concerns! I have to remember that I wear a pin that says redeemed. hey, I think I still owe you for two pins that you owe me. I figure the fact that most people at conference don't speak to me despite my multiple ribbons and sales, is the Lord's way of keeping me humble. And I figure like Jesus saying the well don't need a doctor, the published don't need my attention.